Mmm, coconut oil! This may sound strange to readers, but it’s also a great hair conditioner. (It’s a common hair product used by people with “ethnic” hair… I love it for this purpose.) Just make sure you buy a separate jar for cosmetic purposes. This sounds lovely. I personally love coconut oil. Of course, just like any fat, you shouldn’t sit down and consume buckets of it. Duh. But honestly, saturated fats from whole, unprocessed food sources are fine in moderation, and probably healthy for you. (just like butter is actually better for you than margarine) I like your frame of mind on healthier eating – you’re on the right track. I’m not a nutritionist, of course, but everyone would do better to cut the processed foods, refined flours, and sugars from their diet. And I also realize it’s not easy (I know, I’ve done it – I’m gluten, dairy, and about 99% refined sugar-free.). And with a love for baking, there is a learning curve. But you’ll find like you did with this recipe that using some healthier ingredients can bring fantastic rewards! 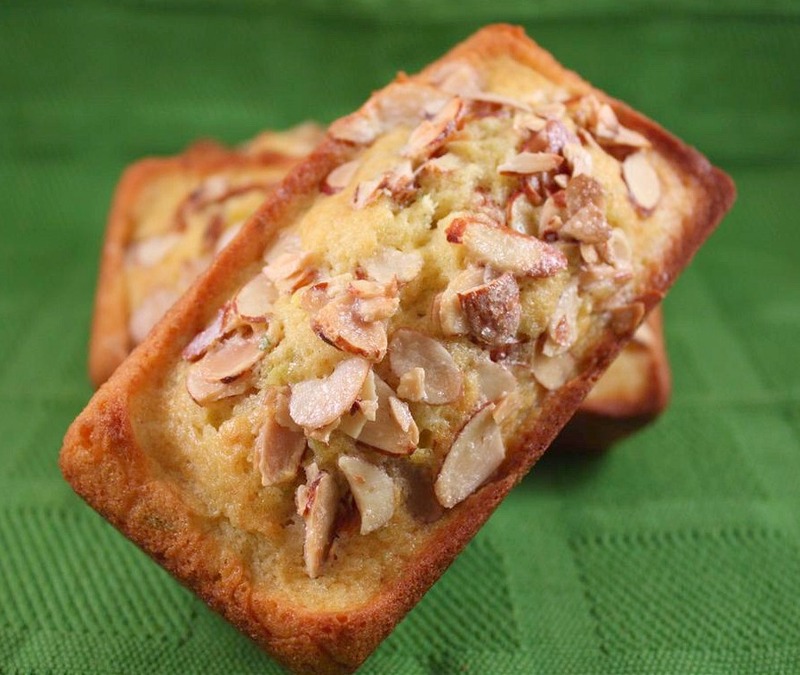 I’m inspired by your pound cake, and I’d love to try a version that’s gluten, dairy, and sugar-free! I’m a HUGE fan of coconut oil and put it up there with things like olive oil. In my opinion, if it comes from a fruit or vegetable it can’t possibly be bad and I think that the research points to that fact. These pound cakes sound delicious! Love that they have hints of both coconut and lime! I have also heard more promising things about coconut oil and hope that they’re all true because this pound cake sounds fantastic. 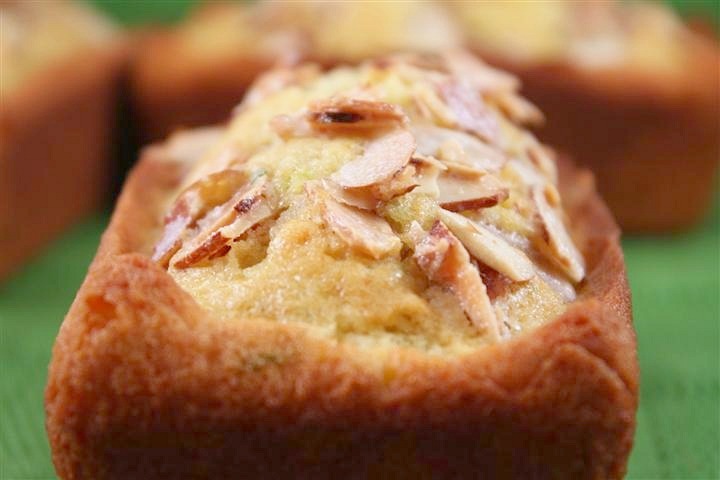 Oh my, coconut and almond – and topping it off with lime takes the “cake” 😉 I love these flavors! Your poundcake looks delicious! I’m an everything in moderation kind of girl! Theres only a few ingredients I really consider off limits. This pound cake sounds so good! Perfect combination of flavors. I really like coconut oil, but I have found that not all oils are created equally. Some brands are really, really coconut-y and I’d swear some were never in the same room as a coconut. I love the lime/coconut combination in this cake. It’s one of my favorite combos. Ooh, that looks really good. I have really liked everything I’ve made with coconut oil. Love coconut and lime, too. I thought coconut oil was suppose to be better for you. That’s what I heard and I’m sticking to it. And I hear ya about cutting out the sugar. It’s been on mind a lot but not put into action. Baby steps are the right direction. At least you started! The cakes sound and look amazing. I love coconut and lime. I know I need to cut down on the amount of sugar in my diet. I’m lucky that I do not have issues drinking my sugar (soda, juice, etc.) but I often get major craving for sugar and can’t stop eating sweets. It’s a hard change but I’m finding other foods to sub into my diet that are keeping me full and satisfied. I’ve never cooked anything with coconut oil, but I’ve read about it and it’s supposed to be really good for you. In tons of ways. This fabulous loaf is a super way for all of us to give it a try. What a marvelous combo of ingredients: almonds, coconut oil, lime; flavor winners all. How does that old song go? Put the lime in the coconut…..
All I know is it looks tasty! I agree with you that everything in moderation is not harmful. I love your cakes and the flavors you incorporated in these! These mini loaves are just gorgeous and they sound amazing made with coconut oil, a must try! These look awesome! Sounds tasty and is something new for me to try. I have never used coconut oil, so here’s too a something new. These mini loaves look delicious and are so adorable! I’m not sure about coconut oil… generally anything fat that had to be melted in order to work with makes me leery, because I picture it hardening up in my arteries. But that’s my totally un-scientific opinion, so take it with a grain of salt LOL. Shoot, not familiar with coconut oil, so digging these responses. The recipe looks amazing. Wow! This sounds/looks so good! So many flavors that sing!!! I’m actually a huge fan of coconut oil…right up there with olive oil, bacon fat, and lard. From the source, not concocted in a lab. I do use it in baking, but I really love frying things in it! It leaves such a clean, light flavor without being overly greasy. These little poundcakes are amazing! I have got to get my hands on some coconut oil. This is the third recipe I’ve seen today that calls for it and I’m intrigued! This poundcake looks amazing…love the flavors and it looks like it would be so moist. Yum! In that first picture, I’m pretty sure the loaf is trying to float out of the computer and into my mouth. mmmmm. I agree with you and think that coconut oil has been getting a bad rap beyond what it deserves. I guess we shouldn’t drinking it for meals, but it’s probably rather healthy to include in our diets, especially versus hydrogenated oils like shortening (boooo). I like your wholesome approach! I’ve gotten off track and have regained a bunch of weight and am considering starting weight watchers again. Are you still doing that plan too? I’m doing weight watchers but I’m trying to incorporate more healthy fats in my diet and less carbohydrates. I like to think I’m eating as if I were diabetic. All those carbs are to much. Even the “recommended” daily amount of carbs is to much in my opinion. Great recipe and beautiful photos! I love things that can bake such pretty loaves. Oh and FYI, if sugar can’t “get into your cells,” it wouldn’t be stored as fat, period. In diabetes, this is why diabetics initially lose a lot of weight (in an unhealthy manner): they are peeing out all the sugar that they eat. Trust me, I’ve been there — not fun! Thank goodness for insulin. True dat. Before I was diagnosed w/ type 1 diabetes, I lost a lot of weight b/c my pancreas stopped producing insulin and I could use the sugar/energy I was eating. Just peed it out and was thirsty all the time. It’s a good thing that is such a miserable state or I’d be tempted not to take my insulin for an easy weight-loss fix but it’s so dangerous, I’m glad I have no temptation to do so! I changed the wording in my post. It’s so hard for me to explain what’s wrong with my body because the doctors don’t spend much time going into it. They basically just tell me that my body holds onto everything and turns it into fat instead of burning it like a normal body. So it’s really hard for me to “naturally” lose weight. They have recommended the lap-band but the idea of surgery freaks me out. I’ve seen a lot of recipes calling for coconut oil lately, but none as delicious looking/sounding as yours! I may just have to bite the bullet and buy some. So glad you found for Food Hound so I could “meet” you and this delectable pound cake! I actually AM a registered dietitian (shhh, don’t let that get out 🙂 and I am sitting up and taking an interest in coconut oil. It was in vogue a few years ago and I scoffed at it like the rest of the mainstream nutrition community, but now I’m recognizing a lot of the benefits. Can’t wait to read the article you linked! And I can’t wait to try these pound cakes- they will be my first experience with coconut oil, and I’ll blog about it! What gorgeous little cakes! Perfect with a cup of tea. I have been seeing more about coconut oil in the last few months, and all of it leans toward the positive side. As you said, I think moderation is the key. I read a blog yesterday (Valsocal) and Val slathers coconut oil on her quick bread:) Sounds good to me. I really want to try your bread~it sounds amazing! Time to add coconut oil to my grocery list. That poundcake looks great… I don’t know much about coconut oil, but I’m willing to give it a try. With most things, moderation is key. i think coconut oil is amazing–in fact, even if it’s clogging my arteries as we speak, i’m still gonna use it simply because of that subtle coconut flavor it provides. yum!